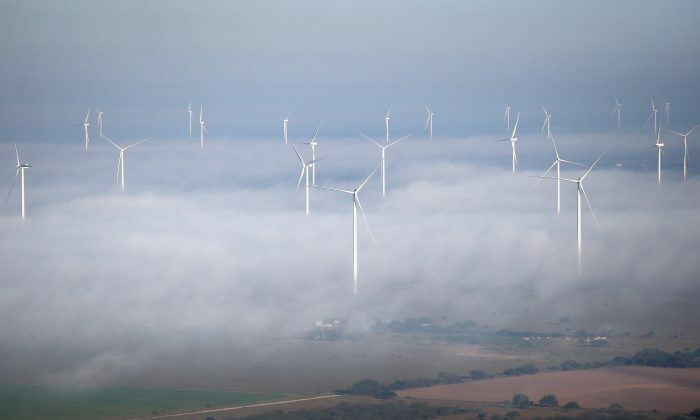 As a fitting postscript to our four-part series about the challenges and limitations of utility-scale renewable energy, it appears that the wheels are coming off in Georgetown, Texas, the dream home of U.S. environmentalists. I have previously questioned Georgetown’s spurious claims to be 100 percent powered by renewable energy, and recent events appear to justify my skepticism. Sorry, Al. At best, Georgetown has been purchasing a lot of renewable generation capacity, not actual electrons generated by windmills and solar panels. However, at least according to an op-ed penned by Texas Public Policy Foundation Vice President Chuck DeVore, they haven’t been able to do that consistently either. Even with generous Production Tax Credits, wind, and especially solar, struggle to compete in free energy markets. Many states game the system through Renewable Portfolio Standards (RPS) that have a percentage generation requirement. California’s RPS, for example, requires utilities to generate 33 percent of the power sold in the state using renewable assets by 2020, 40 percent by 2024, 45 percent by 2027, and 50 percent by 2030. Other states have similar programs, although California’s goals are far more aggressive than most. This type of program forces consumers to pay for renewable power, whether they want it or not, because the state mandate effectively creates a captive market. The Texas RPS is a bit different. Texas utilities were required to have 5,880 megawatts (MW) of renewable generation capacity in place by 2015, a requirement that was fulfilled. Texas also has a goal, not an absolute requirement, of having 10,000 MW of renewable generation capacity in place by 2020. That goal has already been reached, but note that we’re talking about capacity, not actual generation. In Texas, windmills compete with conventional sources of power in a free (relatively speaking) market. Despite much-vaunted increases in wind turbine and solar farm efficiencies, both are still inherently more expensive forms of generation than traditional sources of power like fossil fuel-fired plants and nuclear power stations. That was bad news for Georgetown and its renewable energy champion, Mayor Dale Ross. Georgetown’s electric costs have reportedly risen alarmingly over the past four years as Ross struggled to make his green dreams come true. The town was $3.5 million over their projected electricity budget in 2015, $6.3 million over in 2016, $9.5 million over in 2017, and $10.5 million over last year, according to the Williamson County Sun. It’s difficult to believe that someone on the staff of the city of Georgetown didn’t advise Ross that he was playing a dangerous game by committing his town to pay for all that renewable capacity and to claim—as the town so proudly proclaimed—that it was cheaper to do so. Ultimately, it doesn’t matter whether Ross was foolish or duplicitous, but one strongly suspects one term or the other applies. But that is a common problem among renewable energy champions. If one were legitimately interested in reducing greenhouse gas emissions on a global basis, there are ways to do it that are both affordable and achievable. If one were truly so frightened by global warming that one believes the planet is doomed (perhaps in 12 years?) then there are things we could do in the United States that would reduce our carbon footprint even more than we so drastically have over the last decade. There are two readily available, safe, proven technologies that could be employed to make massive reductions in greenhouse gas emissions at relatively reasonable costs, at least assuming we can operate in a reasonable regulatory atmosphere that isn’t chock-full of litigious “public interest groups” willing to abuse the judicial process to block every new project that offends their delicate sensibilities. The first is a no-brainer: combined-cycle power plants. Two processes are commonly used to turn the energy stored in combustible material such as fossil fuel or biomass into power. Both are familiar. One involves transferring the heat generated to a fluid, most often water, which then vaporizes into steam, which, if confined in a suitably strong system, will generate pressure that can be used to generate useful work, like spinning a turbine connected to an electric generator, for example. This is how a boiler works, a process known to engineers as the Rankine cycle. The other familiar way to convert fuel to work is to take advantage of the gas expansion that occurs when liquid fuel combusts. This gas expansion can be used to push a piston in an internal combustion engine, or to spin a turbine in a jet engine or combustion turbine. This process is called the Brayton cycle. Both the Rankine and Brayton cycles are limited in efficiency. The most you can expect to get out of either is about 35 percent efficiency. That is, for every unit of potential energy you put into a system, you can only expect to get around a third back in useful work. There are many ways that energy is lost, but both cycles have one major deficiency. The Rankine cycle doesn’t take advantage of the gas expansion that occurs when a liquid or solid fuel is combusted, and the Brayton cycle doesn’t take advantage of the heat generated in the process. So, what if we use both? The combination is called combined-cycle and it is the most efficient way to burn fossil fuel by far. A combined-cycle plant uses fuel expansion to spin a combustion turbine (Brayton cycle), and takes the heat of combustion and uses it to raise steam that can spin a steam turbine (Rankine cycle). The efficiency of a combined-cycle power plant is almost double that of conventional utility boilers or simple-cycle (Brayton only) combustion turbines. Increased efficiency equates to greatly decreased fuel use, which means, in turn, dramatically reduced greenhouse gas emissions per MW of power generated. With natural gas as plentiful and cheap as it is, one cannot help but wonder why environmentalists don’t press industry and policy-makers to adopt strategies that have a chance of further reducing greenhouse gas emissions, like pushing for more combined-cycle power. That is, in fact, one of the things that the Sierra Club used to advocate circa the late 1990s, when the Sierra Club still maintained a veneer of reasonableness. As I have said before, I’m not particularly worried about climate change and I believe that both the rate of change and mankind’s contribution to it are too often grossly overinflated. But, I have been rumored to have been wrong before. So if those who are so certain that doom awaits unless we drastically reduce our greenhouse gas emissions ASAP really want to make a difference, why studiously avoid one of the two affordable, proven ways to do so: combined-cycle power? And the other? Well, that’s obvious, isn’t it? It’s the best way mankind has discovered to generate cheap, reliable power and spread wealth to the poorest among us, and it’s the most maligned and misunderstood. Nuclear power could make all the difference, as we will discuss next time.